"I have a question for the PGDipRehab PGDipSportMed- department- a year and half ago I got a very bad IT problem that took months of physiotherapy (strengthening, stability and tensioning etc) and eventually a meeting with a Dr who gave me one exercise of straight legged tensioning with foot tilted in. from the quad to the top of the knee cap, it does not hurt at all, but sometimes it feels like it could give way. Bearing in mind I have no pain. It feels like it is on the tendon or muscle that the kneecap is attached to - just wondering if you have any suggestions?" Although this injury appears to be affecting a slightly different area to what I am about to describe, the majority of cases that fit this description of persistent niggling knee pain with apparent instability may be due to a condition affecting the tendons of medial hamstring muscles where they slide around the bony inside border of the knee and insert into the tibia and help form the knee joint capsule (Refer diagrams). You can see from the diagrams how tightness and inflammation of these tendons can indirectly cause pain in the front of the knee, including the kneecap and patella tendon. It is an area that is easily irritated because of the way the tendons wrap around the tibia and easily confused with conditions such chondromalacia and patellar tendonitis - and even cartilage damage. This explains why so much physiotherapy and surgery for knee pain is wasted time and effort. Knee pain of this kind is more common in women than men, possibly because of their having softer collagen and more stretchy ligaments. It is also worth noting that pain abut the lower leg and knee may not be all that is amiss: If you look at the upper diagram of the rear of the leg, deep, firm palpation of the muscle that is outlined in red may elicit considerable pain. This will need to be addressed because dysfunction, including spasm of this muscle will directly affect knee function, stability and pain. 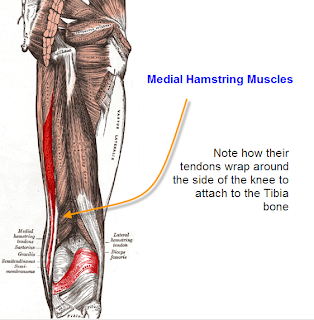 Treatment for this problem is usually a doddle but it does take time: Massage the inside and front of the knee where the affected tendons and fascia slide, insert into the tibia and form the knee joint capsule. Look for areas that are tender and swollen. It is common on women for the insertion point on the tibia to be visibly swollen and may even look like a fluid sack. Massage each of the affected areas firmly but gently for several minutes using a quality massage wax or oil. It is best that this be done by a trained and experienced massage therapist. Do not repeat the massage for another 5-7 days. Do not massage, other than very gently in between but exercise as per normal. Repeat the massage at least 4-6 times or more, or for as long as it takes, until there is no pain or residual swelling. If recovery is poor, or the problem persists, then I recommend that you arrange to consult with me either in person or via Skype. Hi Gary, can you tell me how I prevent this "syndrome" ? the massage seems to clear it up but it only takes a slightly longer ride or a little more time riding out of the saddle for me to set it off again?? first of all, these things can take time and it depends on the quality of the treatment you are receiving which I am unable to comment on (obviously). I obtain excellent results within three sessions over three weeks. There may also be other factors such as a nutrient deficiency and medications. All of these need to be thoroughly assessed which I am able to assist you with. I have this same problem, and it is causing some patella pain near the top / lateral side of kneecap. Basically, I feel a bit of 'snapping' or pulling with the medial hamstring, and I think the quads contract / tighten up in response causing patella pain. I also feel that perhaps the tibia is rotating outwards and my lateral quads are too strong. Are there any specific exercises to prevent this other than massage, I think I have a muscle imbalance. I don't think the problem is to do with anything being too strong. The main problem here is with the hammies not being able to release fully and fast enough in relation to the quads contraction. This will cause the pulling sensation and often pain in the backside. Deep tissue massage of the hamstrings, concentrating on any hard painful spots. The other is to ensure there are no nutrient imbalances that may lead to muscle contraction issues - nutrients such as magnesium and the B vitamins. You may need to have a Hair Tissue Mineral Analysis completed to take out the guessing about this (refer my articles about the HTMA).